While my cake didn't look as professional as the one in the New York Times, it sure tasted amazing! How could it not with fresh Meyer lemon zest in the cake, and preserved lemon juice in the curd. Angel food cakes are a light, low-fat choice for a dessert. And, of course, I used gluten free flour in the cake and coconut cream in the curd. Couldn't be healthier. Right? To make the cake and lemon curd, see the New York Times link here. For the Lemon Cake, I used 1 cup of Cup4Cup gluten-free flour instead of cake flour, and cut back the sugar to 3/4 cup. For the Preserved Lemon Curd, I substituted 1 can of Trader Joe's Coconut Cream for the dairy cream, and cut back the sugar to 1 cup. I made the cake twice to adjust the amount of sugar. The second time, I followed the recommendations in the article, "When It Comes to Angel Food Cake, God is in the Details" for processing the egg whites. The result was a much lighter cake than the first one. Original recipe for the lemon cake from the New York Times website. 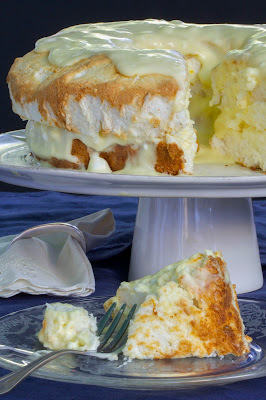 The article on how to make an angel food cake is from the Fine Cooking website.